Fence along esplanade in Red Hook ordered to be removed. Photo: NYC Law Department. Private owner built a fence along the Henry Street Basin. The Gowanus Industrial Park consists of 46 acres of land on the edge of the Henry Street Basin in Red Hook, as well as land under the Basin. The industrial park is adjacent to Red Hook Park, which, in addition to ball fields and a pool, has an esplanade with trees and benches overlooking the water. Prior to 2002, the esplanade had a short, decorative fence that allowed for fishing and provided a view of the water. 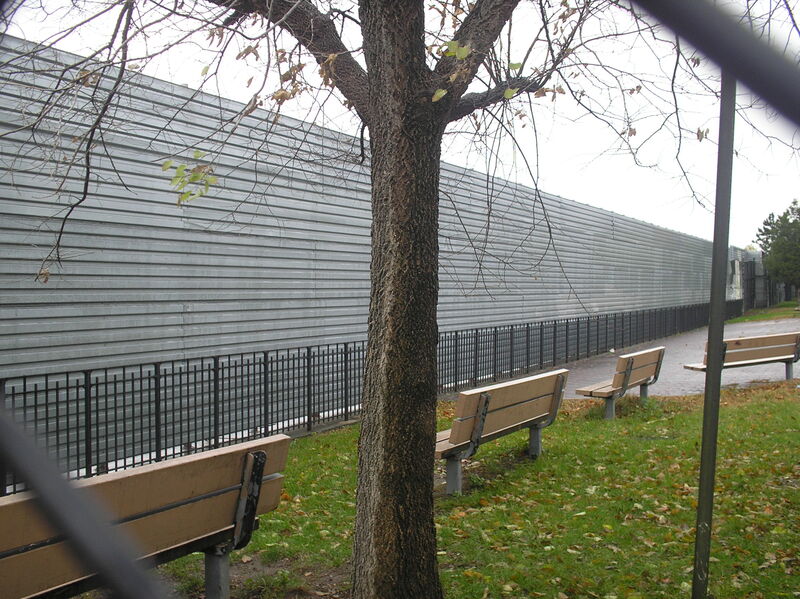 In 2002, however, the owners of the industrial park built a fence on the Basin’s bulkhead, running parallel with the Park’s fence and entirely blocking the view to the Basin. It claimed that the fence was necessary to prevent trespassing. The City sought an injunction ordering the fence’s removal, claiming that the industrial park did not have the requisite special permit to build the fence, the fence interfered with the City’s right to access the Basin, and that the fence constituted a nuisance. After extensive efforts to mediate the dispute, Justice Robert J. Miller ordered removal of the fence. Justice Miller ruled that the industrial park could not build a fence on the Basin’s bulkhead without first obtaining a special permit from the Department of Small Business Services. Furthermore, the court ruled that the City was a riparian owner with rights to the Basin because the City’s Park abutted the Basin. The owner of land abutting navigable tidal waters had a right of access to the waterfront. Finally, the court ruled that the fence constituted a public nuisance because it prevented the public from using and appreciating the waterfront. New York City v. Gowanus Indus. Park, Inc., 2008 WL 2572853 (Kings Cty.Sup.Ct. June 27, 2008) (Miller, J.) (Attorneys: Michael A. Cardozo, Daniel Greene, Chris Reo, for NYC; Joe Paykin, for Gowanus).